Sun Joe SPX3001 2030 PSI Review: Should You Buy Yay or Nay? When searching for a pressure washer suited​​​​​ for home or light commercial use, the Sun Joe SPX3001 2030 PSI washer is an ideal choice. It’s lightweight and has a small footprint, while maintaining a small price tag. It can be collapsed for easy storage, yet despite its small stature, it has a beastly electric motor that produces good pressure. The casing isn’t crafted from the best materials, but for a relatively inexpensive, mid-range product, this doesn’t let the product down too much. Cheap plastic casing lets down an otherwise well-built and thought-out product. With a 2-year full warranty, it’s not the lengthiest but does cover all components. As a mid-range pressure washer with heaps of functionality, it’s highly affordable. 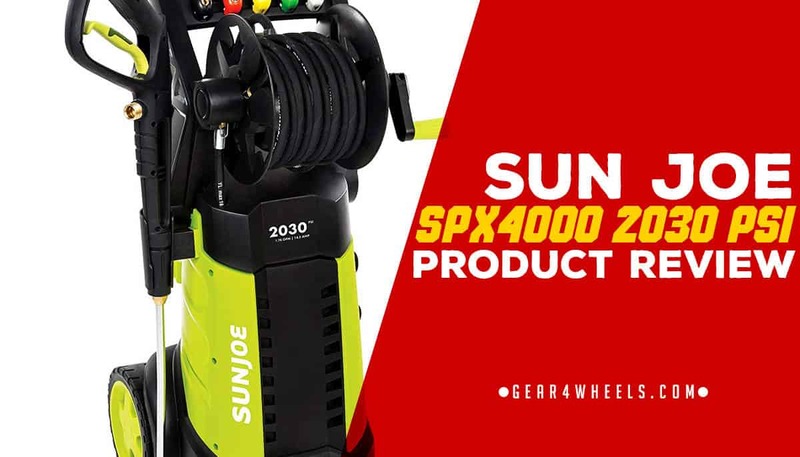 The Sun Joe SPX3001 2030 PSI is one of several Sun Joe pressure washers of similar specifications; the manufacturer tends to release their washers in increments of varying power, as opposed to redesigning from the ground up. It is touted as an easy to use, mid-range washer designed for simple use around the home, though it would also suit simple commercial use, too. This product is well-suited to the proud homeowner who likes to keep their external yard and walkways looking as fresh as their interiors. It's perfect for removing tar and oil from driveways, or tree sap and bugs from car paintwork or glass, whilst it can also handle patio decking. While it would be suitable for a small commercial business, such as a smaller car wash or window-cleaning operation, it would not be suitable for heavier commercial use. The motor is powerful, but not so much suited for continuous, long-term operation. This is evident from the price tag, which signifies a washer that comes in at the budget or mid-range scale. Straight out of the box, this product features an attachable and detachable detergent tank, capable of carrying up to 40.6 fluid oz. (1.2 liter) when full; this is suitable for tackling more difficult stains. Also attached to the product is a hose reel that can rapidly detract and store the machine’s hosing once you’ve finished cleaning. In addition to the default spraying wand, the range of accessories also includes a 34-inch extension to further the already-impressive range of the machine, which attaches to the 20-feet of hosing included. In terms of nozzles, there are 5 quick-connect spray tips packaged with the pressure washer, ranging from 0° through 15°, 25°, 40° and another designed for use with soap. It's worth investigating whether you'll need any additional accessories with this product, depending upon your intended use. For example, 20 feet is short for a hose - many come with at least 25. You could purchase a hose extension, but it would not be compatible with the reel and would have to be detached after use to fully retract the hosing again. You might also want to consider some more specialized attachments such as brushes, but remember, only Sun Joe attachments are compatible. One of the features that makes this pressure washer suitable for such a broad range of home purposes is the inclusion of a pressure switch that allows free switching between 1,450 and 2,030. The washer also features something called a TSS, or Total Stop System, which is a function that automatically turns off the machine's pump if the trigger is not engaged. This has a double benefit of both improving the lifespan of the pump, as well as preserving energy. This Sun Joe pressure washer is perfect for the casual home user, or small business professional, where budget is one of the main concerns. It has enough power for the smaller cleaning tasks, whilst including some functionality beyond that of budget-range models. The compatibility with hose extenders means that it can be improved to also take on larger jobs.